I gave it to my daughter for Easter, She loved it! Sterling strands of silver are neatly woven together and mimic the signature design of the allegorical 'Crown of Thorns'. Khun Katsaya forges this band ring from sterling silver .925 and designed it as a 'Stackable' piece to be worn with other band rings. Katsaya has been in the jewelry design business for a long time but she has never considered it work, more of a passion. Katsaya first started designing jewelry in Chang Mai, the handicraft epicenter of Thailand. She learned her trade from her father and uncle who were silversmiths. She helped design all the jewelry for her father and uncle. She loves what she does and feels proud that she is able to pass down her skills and talents to the younger generation of her family. 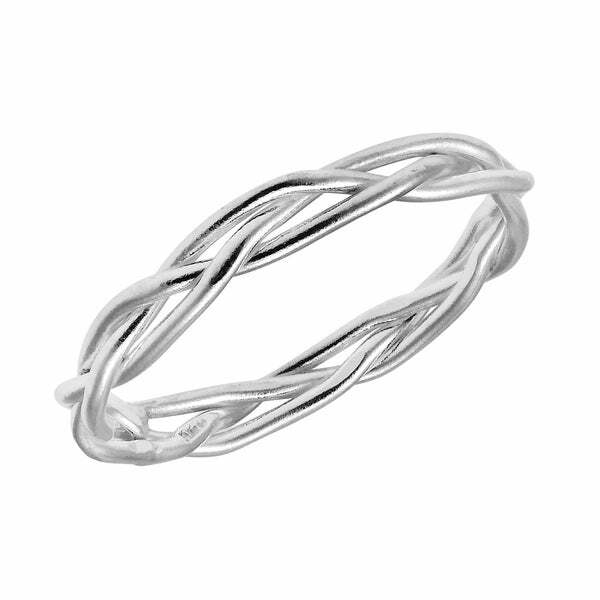 This is a simple concept yet alluring ring, it is sterling silver and of good quality. The first thing I saw were the reviews. Yes, I use this as a reminder daily that I am a sinner saved by grace. When the ring first came it was very pretty. Within 3 weeks it has tarnished!!! I keep all of my silver jewelry in a felt lined box. I have never had this happen and am totally disappointed in Overstock. Now it makes total sense why this ring is priced so well. It's cheap!! Really, really like this band! Nice quality of silver with a great design that isn't overly done. A simple and delicate ring. I bought it to wear with other rings, and it's simple design does not overpower the other ring with a stone in it. Seems to be well made and the silver is bright. This ring is one of my favorites! I wear it every day! I like solid silver and white gold jewelry and it goes nicely with most of my jewelry. It also reminds me of Jesus. So, yeah, it’s great! I purchased this ring some time ago. I can recommend the ring ...it’s beauty and quality. I can recommend Overstock......its shipping and it’s service. However, I did not wear the ring. It was too large. In spite of that, let me say this, the ring is lovely. Very cool ring. Higher quality than I imagined it would be. It has kept it's shine and looks elegant even though it's just costume jewelry. Very pretty silver. True to size. I bought this for a thumb ring and have worn it every day. It is comfortable and I have no complaints whatsoever. I will buy it again. The ring is small and delicate and fits my finger just right. I stack it with another ring and it looks good. Would recommend it to others. Very nice! My granddaughters will love them. Thank you. Gentle everyday reminder of the Lord. Sterling Silver Rings Fact Sheet from Overstock.com. Our guides provide customers with information about sterling silver rings.